In 1979, after the fall of the Shah and the formation of the Islamic Republic in Iran, a chance appeared to present itself for strengthening the position of Iraq in the region. Until then Iran, also a large producer of oil and itself heavily armed, had been one of the leading powers in the Gulf region, holding two-thirds of the world’s oil reserves. Taking advantage of the confusion and chaos surrounding the change of power there, Saddam Hussein’s regime hoped to fill the regional power vacuum that had been created. Baghdad also had set its sights on the conquest of Khuzestan – an ethnically Arab province of Iran, bordering on the Iraqi province of Basra and the Persian Gulf – and on regaining full control over the Shatt al-Arab (after the humiliation of the 1975 Algiers Treaty), which would eliminate Iraq’s landlocked situation. Finally, Saddam Hussein hoped that, by involving Iran in a war, the new Islamic Republic would be weakened, and he could thus eliminate the encouragement the Islamic Revolution was undeniably giving to Iraq’s Shiites. Because of their shared fears about the export of this revolution, Iraq was assured of support, in any future conflict, from most Arab regimes and their Western allies, Tehran having further alienated itself from the West by taking hostage the staff of the US embassy. Moreover, Khuzestan was the Achilles’ heel of the Iranian economy, because it contained most of the country’s oil reserves and oil-industry facilities. If Iraq could take possession of Khuzestan, it would control oil reserves even greater than those of Saudi Arabia. On 17 September 1980, Saddam Hussein’s regime seized on verbal threats and a small border incident in order to revoke the treaty that had been wrested from it five years earlier, at Algiers, regarding the Shatt al-Arab, thus placing the border waterway again entirely in Iraqi hands. Five days later the Iraqi army invaded its neighbour along the coastal plain in Khuzestan; the Iraq-Iran War had broken out. After this invasion, the United Nations Security Council did not condemn Iraq or call upon it to withdraw behind the internationally acknowledged boundary; it simply adopted a resolution calling on both parties to enter into an immediate cease-fire. The surprise attack on Iran did not, however, have the results that Iraq and others expected. It did not lead to the collapse of the Islamic Republic but, in fact, helped consolidate its power. After Iran recovered from the initial shock, its troops were quickly able to halt the Iraqi advance. Nowhere did the Iraqi ground forces penetrate more than 75 to 100 kilometres into Iranian territory. Khuzestan’s Arab population did not flock to Saddam Hussein’s side. By mid-1982 a series of offensives had driven the Iraqi forces back over their own border. The Iranian Air Force then took the war to Iraqi cities, causing great destruction, particularly in southern Iraq, and neighbouring Syria, with which relations had been difficult for many years, shut down the oil pipelines to the Mediterranean, cutting off Iraq’s most important source of revenue. Economic problems began to grow. On 22 September 1980, Iraqi troops invaded Iran, starting a war that would last for eight years. The first Gulf War, better known as the Iraq-Iran War – the ‘Imposed War’, as the Iranian authorities came to call it – was one of the longest and most atrocious inter-state conflicts since the end of World War II. The consequences for both countries were tremendous. An estimated million lives were lost, and a further two million people were wounded. About 40 percent of the adult male population in the two countries took part in the war. More than one million people were uprooted during the war. At least 157 Iranian towns were severely damaged or destroyed, and 1,500 villages were wiped off the map. The overall cost of the war has been estimated at USD 1.2 billion. The explanations of the historical origins and immediate causes of the war are many. While some studies emphasize the territorial dimensions of the conflict, others focus on the role of conflicting ideologies. There are studies that stress the long-standing Arab-Persian animosity and others that underline the immediate danger to Iraq and the regional order posed by Iran’s Islamic Revolution. An immediate cause of the war was the long-standing question of sovereignty over the Shatt al-Arab (in Arabic), or Arvand-Rud (in Persian). The 200-kilometre-long waterway, of which the last 80 kilometres form the frontier between Iran and Iraq, is strategically important for both countries, because Basra, the only Iraqi port with access to the Persian Gulf, lies upstream, and both countries have oil installations near the waterway. 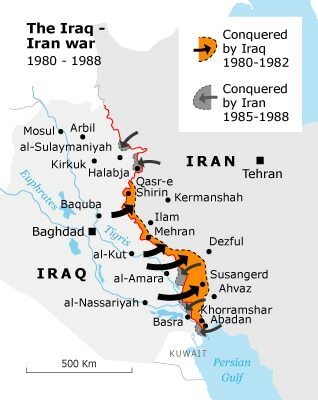 Iraq and Iran had engaged in border clashes for many years but reached an agreement in 1975 in Algiers, before Saddam Hussein in late August 1980 issued an ultimatum demanding that Iran grant Iraq sovereignty over the Shatt al-Arab. When the ultimatum expired without a reaction by the Iranian government, Iraqi troops invaded Iran. Iraq saw the Iranian Revolution not only as a threat but also as an opportunity. Saddam Hussein believed that the internal turmoil created by the revolution, the purges, ethnic uprisings, and political rivalries, had weakened Iran’s society and armed forces. He believed that the Iranians would therefore be unable to repel a military attack and could be pressured into accepting his demands. But, contrary to the expectations of the Iraqi leadership and of many military analysts at the time, the Iranian forces withstood the Iraqi invasion and from 1982 onwards took the war into Iraqi territory. The unexpected strength of Iran can be explained largely on nationalist grounds and by the fact that the leadership enjoyed the support of much of the population and could mobilize hundreds of thousands of volunteer soldiers for the struggle. Even after Iran had regained its territory, the Iranian leadership did not accept calls for a ceasefire and insisted on the removal of Saddam Hussein and his regime. Some argue that the Iranian leadership understood well that the prolongation of the war could also greatly influence the outcome of the internal struggle for power and the eventual shape of the revolutionary state. Throughout the war years Ayatollah Khomeini rejected peace offers from the Iraqi regime and its supporters. The slogan Jang, Jang, ta Piroozi (War, War, until Victory) was often used in wartime propaganda. Martyrdom was propagated as the highest goal. In this light it is hard to imagine how the Iranian leadership could justify its acceptance of the 1988 UN Security Council Resolution 598 demanding a ceasefire. From 1986 onwards, war weariness set in. Victory was not in sight, the economy was devastated, and tens of thousands of young men had already sacrificed their lives. Growing criticism of the war policy forced the Iranian leadership to start ceasefire negotiations in 1988. 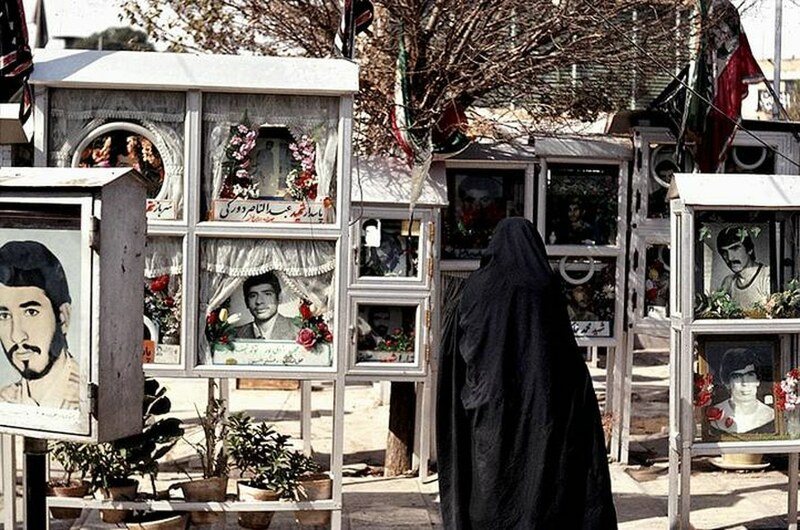 The downing that year of an Iranian civilian airliner (supposedly accidental) over the Persian Gulf by the USS Vincennes, killing all 290 passengers, is seen as an immediate cause of the change in Iranian attitude. The images shown above are stills taken from this British documentary (36 minutes).